The perfect companion for freestanding tubs, these fillers stand gracefully next to the tub. Some require a support bracket that is attached to the wall or to the tub drain. This is mostly true with the traditional style that are designed with two risers. Others are totally freestanding. This is mostly the case for the contemporary style that fits with the lines of a sleek modern bathtub. Check the height of the freestanding tub. Compare this with the spout height: the measurement from the floor to the bottom of the spout. 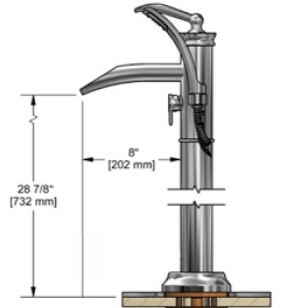 The faucet has to be tall enough to comfortably clear the rim of the freestanding tub, but not so high that it towers over it. The faucet spout also has to be long enough to reach into the tub. 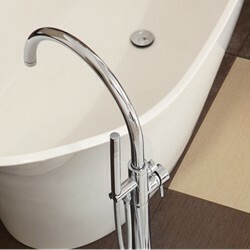 Check the bathtub's technical information to see rim height and width. And see the technical sheet for the faucet for all measurements. 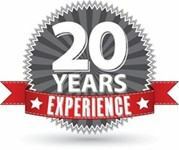 If a faucet fills at 6 gpm (gallons per minute) and your bath holds 120 gallons - expect 20 minutes of fill time. Change it to 15 gpm and the fill time is cut to 8 minutes. 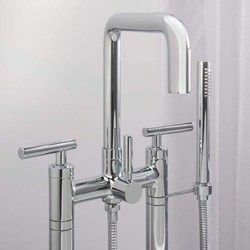 We have listed the faucet finishes offered in the descriptions below. If "multiple" is listed, there are too many to list - click on the tub faucet to see more information. We understand the importance of this feature. We ship all our tub fillers directly from the factory to you. The savings from doing this are also passed on to you. You will see list prices when you look at the faucets. Just give us a call or drop us an email and we will gladly give you the best price we can. Faucets are listed by spout height, shortest to tallest. Click on the faucet picture for more information.